BLD Plantation Bhd, a Malaysian palm oil company, plans to clear some 14,000 hectares of peatlands in Sarawak, on the island of Borneo, potentially putting it in conflict with the deforestation-free sourcing policy established by American agribusiness giant Bunge, say campaigners who filed a grievance over the matter. In a statement issued last week, Forest Heroes announced it has formally filed a complaint via Bunge’s grievance system in anticipation of BLD Plantation’s peatland clearance. The complaint urges Bunge to suspend sourcing from the company, which supplies the multinational with palm oil via the Kirana refinery in Bintulu, Sarawak. It also asks BLD to adopt a zero deforestation policy and restore an area of peatland equivalent to the 6,000 ha it has already cleared. Forest cleared and planted with oil palm in Miri, Sarawak. Photo by Rhett A. Butler. Forest Heroes’ demand came a month after Bunge shareholders voted overwhelmingly (28 percent in favor, 68 percent against, 3 percent abstaining) to reject a resolution to formally adopt a zero deforestation policy. 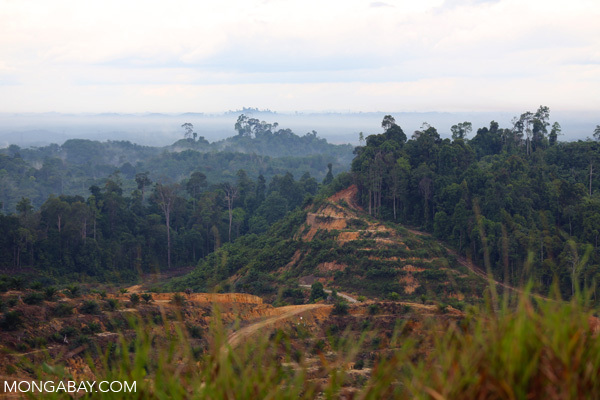 No Comments to "Bunge palm oil supplier plans to clear peatlands for plantations"